Maintaining a healthy diet is just as important for us as it is for our furry friends! Processed pet food may not always have the ideal amounts of fiber and other nutrients. 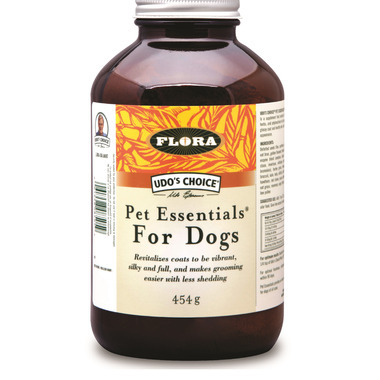 Udo's Choice Pet Essentials for Dogs offers the optimal nutrients to supplement your cat's normal diet. This supplement will energize your pet, promite regularirty and revitalize hair coats. Your pet deserves the best- naturally! defatted brown flaxseed, defatted sunflower seed, defatted sesame seed, rice bran, oat bran, whole golden flaxseed. carrot, Soyforce™ powdered sprouted soybeans, tomato, kale, beet, broccoli, kelp, Udo’s Choice® Ultimate Digestive Enzyme (amylase, lipase, protease, cellulase, glucoamylase, invertase, malt diastase, lactase, pectinase [with phytase] and bromelain, in a base of beet root powder), artichoke. ginger, hawthorn berry, milk thistle, burdock root, red clover, parsley, bee pollen, chrysanthemum, yucca, lemon grass, dandelion root and leaf, rosemary, thyme, sage, dulse. PINES™ barley, alfalfa, oat and rye grass powders, chlorella. Add 2.5 g (1 tsp) per day to your pet’s regular food. Give free access to water. For optimum results: Double the amount for 45 days and add ¼ tsp of Udo’s Choice® Udo’s Oil™ 3•6•9 Blend. For optimal freshness, refrigerate after opening and use within 90 days. Have used this on my Border collie mix for 5 years and now using it with our 2 yr old Border collie/mini aussie shepherd. We use it as a supplement in their raw food mix. I used this product for my previous Maltese for 12 years and I've been using it for my current Maltese for about 5 years. I really like this product as a supplement to the kibble dog food.